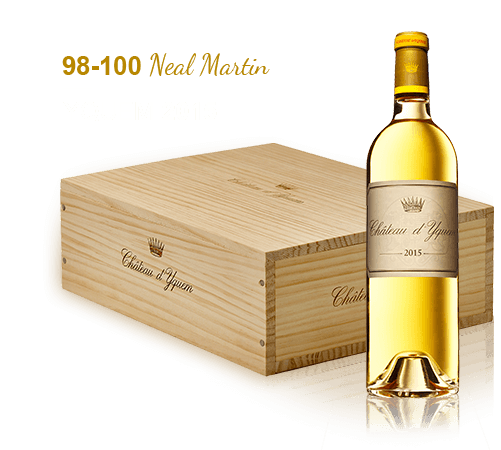 “The 2015 Château d'Yquem is a blend of 75% Semillon and 25% Sauvignon Blanc that was picked on the gravelly soils as early as 3 and 4 September until 21 October, four tries through the vineyard. It delivers 144 grams per liter of residual sugar, with six-grams of tartaric acid, a pH 3.65 and 13.9% alcohol. It has a show-stopping bouquet that is beautifully defined and very complex and exuberant, infused with greater mineralité than recent vintages - intense but not as flamboyant as say the 2009 Yquem at this stage. The palate boasts absolutely stunning balance. This is a Yquem without a hair out of place: fantastically pure, botrytised fruit caressing the mouth. That is as per normal. What distinguishes this Yquem is the sense of electricity that is imbued by that razor-sharp acidity. There is just unbelievably tension here and to be frank, there is little point in me continuing to write this note, because it is simply an astonishing Yquem that will rank alongside the 2001 and 2009.